Total Workshop search results: 4. Displaying Page 1 of your woodworking search phrase CHILDRENS LAMPS. 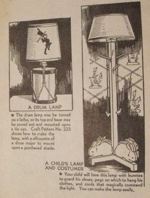 This enchanting tabletop lamp not only looks great sitting on a childs dresser, it also features unique lighting options. A special lamp socket operates the main and nightlight bulbs separately or together. 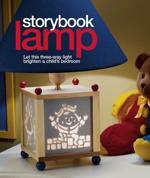 Included with the plan are four different storybook characters to scroll saw on back-lit panels. For those of you who want to build this project but do not wish to scroll saw the back-lit panels, we provide a source for precut panels. It does not get any easier than that! The square base of the lamp measures 7 inches wide x 7 inches deep x 7 inches high. 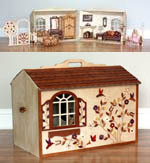 Link Type: free plans | Link Source: MarthaStewart | Visit the category | Fix Link?